A couple of testers notice that the Under Armour Curry 3ZERO 2 has a nice heel-to-toe transition. Reviewers are really happy that the cushioning system, which is composed of Micro G and Charged, is able to provide impact protection, responsiveness, and walking comfort. The traction just gets the job done with these high-top shoes for performance. At least one buyer reports that the shoe is true to size. The materials that these Under Armour basketball shoes are made of are soft, comfortable, and pretty supportive. For only $100, these budget-friendly basketball shoes just deliver so much. Not a lot of reviews have been made for the Under Armour Curry 3ZERO II. Reviewers unanimously say that the toe area has a bit of extra space, affecting stability and fit in that area. The materials, though soft and comfortable, may feel cheap to the touch. It is very safe to say that the Under Armour Curry 3ZERO 2 is a very good on-court performer. The Micro G and Charged in the midsole really do their job of providing just the right mix of court feel and impact protection. The shoe’s traction also delivers just right. There are issues, but they are either easily remedied or too minor to even matter. 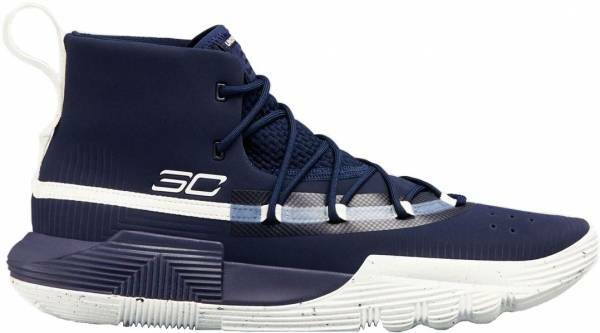 If you only have $100 for basketball sneakers, it should really go to these Stephen Curry shoes. For its price and the performance features and the performance overall or the playability of this shoe that it offers, this is a great deal. They play better than more expensive shoes. The Curry 3ZER0 2 was a nearly perfect shoe for Guards. Had it had a heel counter then it would have been — especially at the $100 price point. I’d take the 3Zero2 over the Havoc all day no questions asked, no refunds, thank you come again. It does EVERYTHING better than the Havoc except maybe support but the stability of the 3Zero2 makes up for it. HOVR might be the newer cushioning but I’m comfortable saying it doesn’t feel much better than Charged especially how it’s implemented in the Havoc and it certainly doesn’t give me any additional energy return. I’m trying to work through heel slip and breaking in the cushioning more before a final assessment of the Havoc. The Curry 3ZERO 2 is another signature team model from Under Armour. It has Micro G and Charged in its cushioning system, so it’s almost a given that the shoe is going to be responsive and comfortable. Its two-piece outsole features a unique multidirectional tread pattern. To ensure breathability and comfort, the leather-like material in the upper is backed with foam, especially near the Achilles. Because of the greatness that they bring, you won’t believe that these Stephen Curry basketball shoes are only for $100. Some wearers don’t worry spending a few dollars more for a recent shoe model. The sixth Stephen Curry in a low-top is ready to be tested on courts. Cushion. So that the wearer will experience a great amount of court feel and impact protection, the shoe is equipped with a Micro G carrier and a Charged unit at the heel. This setup is pretty similar to the one in the original Under Armour Curry 3ZERO. Traction. Under Armour says that the shoe has a two-piece sole that extends significantly on the lateral side to provide 360-degree support. The tread pattern on the sole features rectangles and straight lines in various orientations. This unique pattern allows the shoe to have a multidirectional grip on the floor. Length and Width. Because the upper is made of soft materials, it easily conforms to the shape of the foot. This results in a one-to-one fit that is enjoyed by many. With this, new buyers are advised to just go with their usual Under Armour sizes. Lockdown. The Under Armour Curry 3ZERO II relies on its uniquely designed lacing system for lockdown. It’s heel pull tab is actually connected to a ribbon that outlines the shoe’s throat. This ribbon also serves as loops for the shoelaces. To further secure the ankle, there are foam pillows embedded right at where the Achilles is. Specifically, these pillows tighten the shoe’s grasp on the ankle. Save for the tongue, which is made of knit, the UA Curry 3ZERO 2 is entirely made of a material that the company calls ‘molded maxprene.’ This material conforms to the shape of the foot, providing a type of fit that is so close to the skin but never too tight. The Curry 3ZERO 2 is a high-top that has a more blocky appearance than most Curry shoes. Its almost monochromatic skin gives it a more streamlined look. The shoe’s neatness makes it easy to pair with almost any type of active or casual wear. The Curry 3ZERO 2 has the Under Armour logo on the rear medial side. It has Stephen Curry’s SC30 logo on the rear lateral side. The top of the tongue has a large SC30 logo on it. Directly above the SC30 is a simple ‘UNDER ARMOUR’ callout.